COLORED ICEBERG: The Norwegian researchers didn't believe their own eyes when they saw this in the water. Resembling a strange creature from the deep, this rare marbled iceberg was spotted in the waters of the Antarctic by a Norwegian sailor. �yvind Tangen, 62, was on board the research ship G. O. Sars when he photographed the unusual ice formation, floating a few miles off the coast of the frozen continent. While most icebergs are white due to tiny bubbles trapped inside, which scatter the light in every direction, some pick up a multitude of colours due to various natural phenomena. Green stripes are the result of algae growing in the ice, while brown, black and yellow lines form as the ice sheets from which bergs are formed pick up layers of sediment. 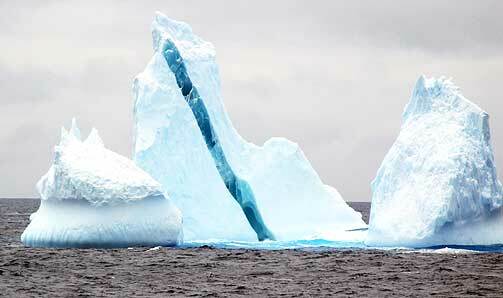 Deep blue lines can also appear when the air bubbles are squeezed out due to rapid melting and re-freezing of the ice. LONG STRIPE: This stripe is most likely the result of melted surface water from when the ice was on land. I read about it in the newspaper yesterday!! Far from a rainbow iceberg, where dem colors at? #1 t.nu Gareth Emery superfan! Buying trance is a lot like buying a car. Don't buy american. kamil has a compliant signature. Thanks Dancemania! The most Photoshopped looking thing I've ever seen, lol.